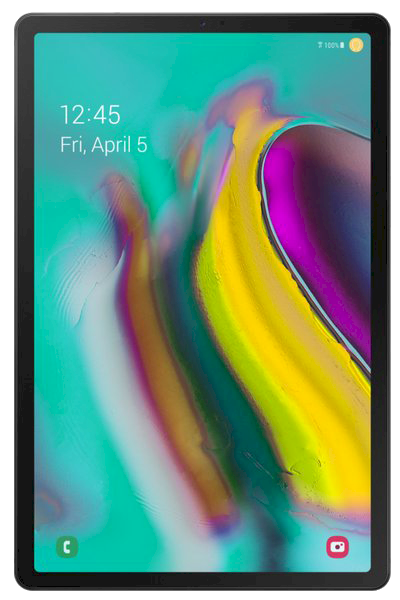 Samsung‘s Galaxy Tab S5e SM-T720 specifications and features: this is a 10.5” (266.7mm) device with a WQXGA 1600 x 2560 screen resolution. The phone is powered by the Qualcomm Snapdragon 670 soc with a Dual Core 2.0 GHz & Hexa Core 1.7 GHz configuration. Memory is 4GB, 6GB, with the device offering 64GB, 128GB internal storage and up to 512GB of external memory. The Galaxy Tab S5e features Accelerometer, Fingerprint Sensor, Gyro Sensor, Geomagnetic Sensor and Hall Sensor. Notable features include Bixby 4 speakers sound by AKG, Dolby Atmos. The device measures 245.0 x 160.0 x 5.5mm and weighs 400g. The Samsung Galaxy Tab S5e price is $399 (around £300, AU$560) placing it firmly next to the Apple iPad 9.7 and Microsoft Surface Go, which carry similar price tags. The Samsung Galaxy Tab S5e release date is set for Q2 2019 (Apr-Jun) for the US, Germany and more, but no clearer data has been revealed just yet. We’ll update this hands on review as soon as we know more. As we’ve already mentioned, one of the big selling points for the Samsung Galaxy Tab S5e is its portability. We were genuinely surprised just how lightweight this tablet is when we first picked it up, and it’s something you can easily slip into a bag and forget it’s even in there. 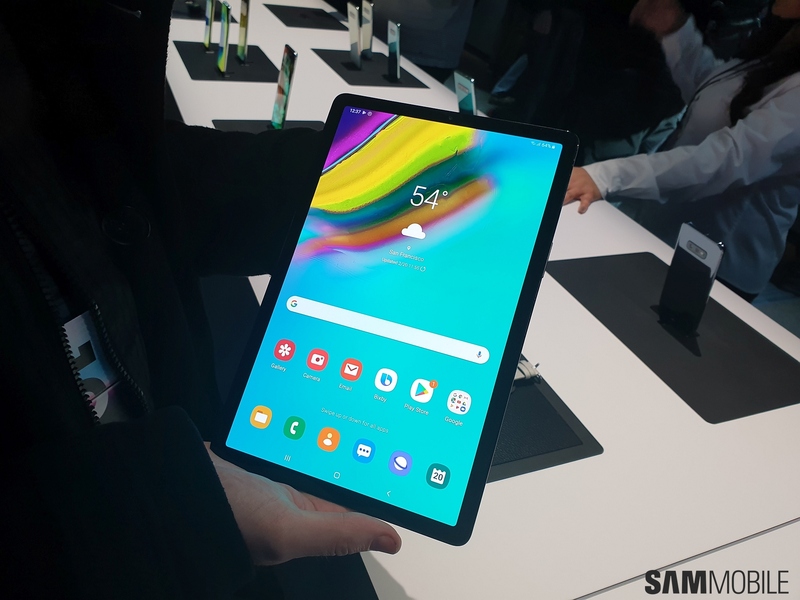 It low weight also means the Galaxy Tab S5e is easy to hold for extending periods of time, and is less taxing on the wrist – movie and gaming marathons on the move are very much a possibility here. The Galaxy Tab S5e tips the scales at 400g, which is comfortably lighter than the 469g iPad 9.7 2018. It also measures 245 x 160 x 5.5mm, making it one of the thinnest slates on the market – however it comes at the expense of losing the headphone jack. You do get an adapter in the box however, allowing you to plug in your wired headphones via the USB-C port. The only ports on the Galaxy Tab S5e are a USB-C opening and a POGO pin connector for attaching a smart keyboard. The power/lock key is located towards the top of the right side of the tablet (when held in portrait) and it has a fingerprint scanner built into it. This means there’s no need for a button on the front of the tablet, which has allowed Samsung to reduce the size of the bezels on the Galaxy Tab S5e. They’re still noticeable, but offer a good space to place your thumb when holding the slate. Below the fingerprint scanner is the volume rocker, and both keys are relatively easy to hit, although you’ll need to employ both hands to use them if the tablet isn’t resting on a surface. While the metal unibody of the Galaxy Tab S5e provides a premium feel, there’s no escaping the fact the rear of the tablet looks rather bland. It reminds us a little of budget tablets from a couple of years ago, and fails to command the same pleasing aesthetics as Apple’s iPad range. Rounding off the design are the four stereo speakers tuned by AKG, two located at each end of the tablet. We weren’t able to listen to them in the noisy hands on area at Samsung’s Unpacked event though, so you’ll have to wait for our full review to find out how they sound. Shifting our attention to the screen, and the Samsung Galaxy Tab S5e has an impressive 10.5-inch QHD Super AMOLED display which delivers excellent clarity and vibrancy. If you’re looking for a tablet to use as a media device, the Tab S5e could well fit the bill. The Galaxy Tab S5e runs Android 9 Pie with Samsung‘s interface on top, and from our brief time with the tablet it seemed to run well, although it lacked the zip of the more powerful Galaxy Tab S4 and its iPad rivals. There’s 64GB of storage onboard, but if that’s not enough the Tab S5e also comes with a microSD slot which supports cards up to 512GB in size, giving you plenty of flexibility. Samsung is also making a 6GB of RAM with 128GB of storage variant of the Galaxy Tab S5e, but it’s currently unclear which markets this will be available in and how much it will cost. In terms of productivity, Samsung is primarily touting the Galaxy Tab S5e as its first tablet with the Bixby digital voice assistant installed. The feature will use the tablet’s far-field microphones for voice commands aimed at saving time and keeping you organized, like Google Assistant does. However, the far more important feature as far as productivity is concerned is DeX, which adds features like side-by-side app view. This, and a Samsung Account feature that will allow for remote access to a paired Samsung smartphone, is what will drive the majority of the tablet’s appeal against the Surface Go and iPad. Inside the metal body of the tablet is a huge 7,040mAh battery which should deliver some solid usage from a single charge (Samsung claims 14.5 hours), but you’ll have to wait for our full review to find out how it performs. There are cameras on the front and back of the Galaxy Tab S5e, but as is often the case with snappers on tablets they’re average at best. We managed to take a few shots with both during our hands on time, and found shutter speed to be a little slow and image quality lacking detail (especially when you compare it to mid-range smartphones of a similar price). There’s a 13MP rear camera on the Galaxy Tab S5e along with an 8MP selfie snapper, if you are thinking about buying this for the photography capabilities – for field work, for instance.